We’re incredibly excited to be supporting Magpie Goose with a debut stall at our Brisbane market this weekend. Magpie Goose is currently being incubated by Enterprise Learning Projects (ELP), an organisation dedicated to fostering and supporting grassroots business development in partnership remote Aboriginal communities. 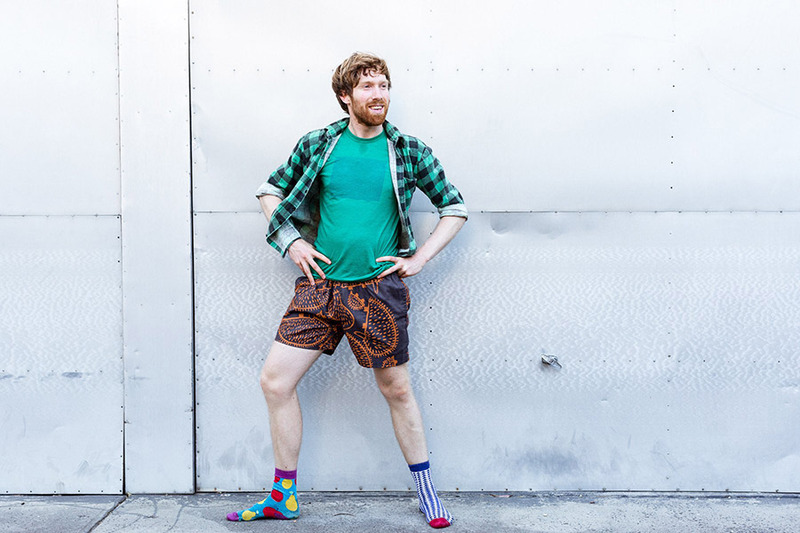 Another bold, bright and exciting designer who’s our top pick this summer! Read on for our interview with label co-founder Maggie. It’s been a big journey in a very short time! Last April my partner Laura and I were having a drink in Darwin and reflecting on a bad day I’d had at work. She asked what I’d be doing if I wasn’t Bush Lawyering (at NAAJA in the NT), and my mind immediately turned to the fabulous hand screenprinted textiles designed and printed in remote Aboriginal communities. These textiles tell stories of people, dreaming, landscapes and traditional motifs – in a bright, bold, fun, contemporary format. And so the idea for Magpie Goose was born! 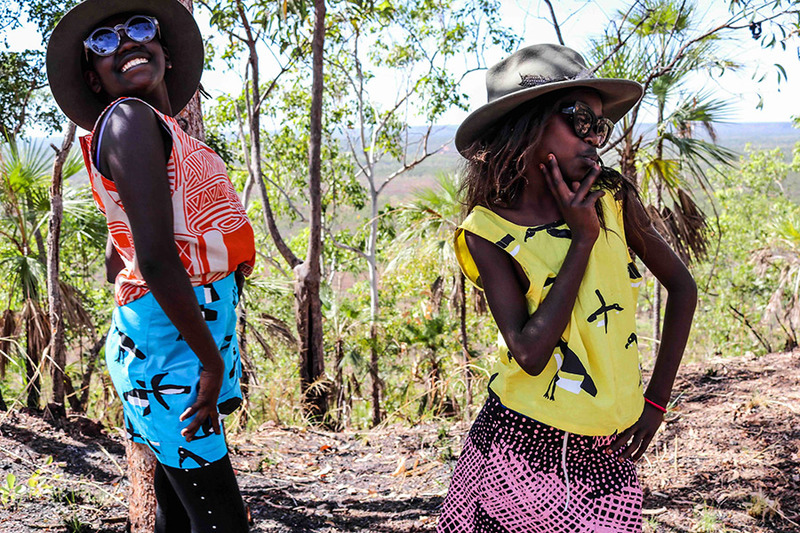 Bright, bold, unapologetic fashion for people seeking connection with Aboriginal stories, people, and art. We struck up a business partnership with a tailor in Bali, got some samples made up – simple, statement designs that let the textiles do the talking; and did a big pre-order run on Kickstarter in Feb/March this year, which attracted 650 pre-orders worth $100,000. In March I took a hiatus from the law to concentrate on Magpie Goose fulltime; we launched our online store in August; and now here we are at Finders Keepers! Phelecia Daylight in Injalak Arts, Reuben Manakgu ‘wakih’ (fresh water prawn) print and Samara Billy in Dora Diagram’s Murnubbarr Karrolka (flying magpie geese) print from Babbarra Women’s Centre and Phelecia Daylight in Reuben Manakgu’s ‘wakih’ (fresh water prawn) print – By Magpie Goose. Image Credit Photo by Rhett Hammerton. 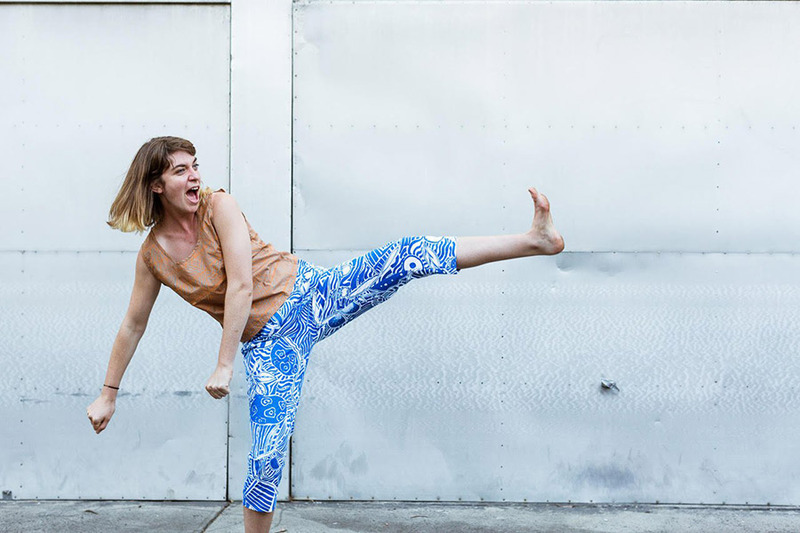 Talk us through a typical day in the life of Magpie Goose. Do you work full time on your label or are their others on your team? Do you have a studio or do you work from home? Laura and I are co-founders of Magpie Goose. I’m currently working on Magpie Goose fulltime; and Laura spends about one day a week on big picture/ strategy. Laura heads up Enterprise Learning Projects (ELP), an organization that works in partnership with Aboriginal communities to share culture and foster economic inclusion through enterprise. ELP is incubating a number of businesses (including Magpie Goose) – a fabulous bush medicine herbal tea (Gulbarn), cultural bike tours, bush soaps, op-shops etc – so there’s a lot on Laura’s plate! She’s also trying to get a Katherine Incubation Hub off the ground – so we can develop an ecosystem of entrepreneurship in the Top End! We currently work from our tropical Katherine home, but are searching for a studio space, as Magpie Goose has huge capacity to expand and offer lots of local jobs. A typical day for me is popping in in the morning to brief our new Katherine screen-printing team who are printing designs we commissioned from local artists (we rent the space from a local arts organization); liaising with our four remote art centre partners to choose designs, base cloth and colourways, and get the fabric printed and down to our new manufacturers in Sydney; applying for grants so that we can offer enterprise learning and employment opportunities to Aboriginal people in our partner communities through Magpie Goose; planning future ranges and choosing new designs from new art centres; planning and dreaming for the future – like how we can support local printing and manufacturing in the NT! 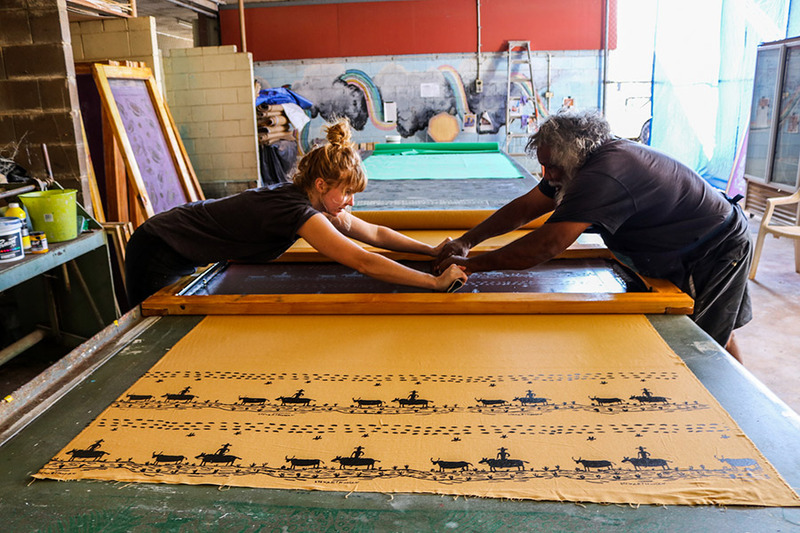 Stewart Hoosan (From Borroloola) and Millie Shorter printing Stewart’s ‘Ringer’ design at a screen printing /design workshop for Magpie Goose in Katherine, August 2017. Image Credit Photo by Maggie McGowan. 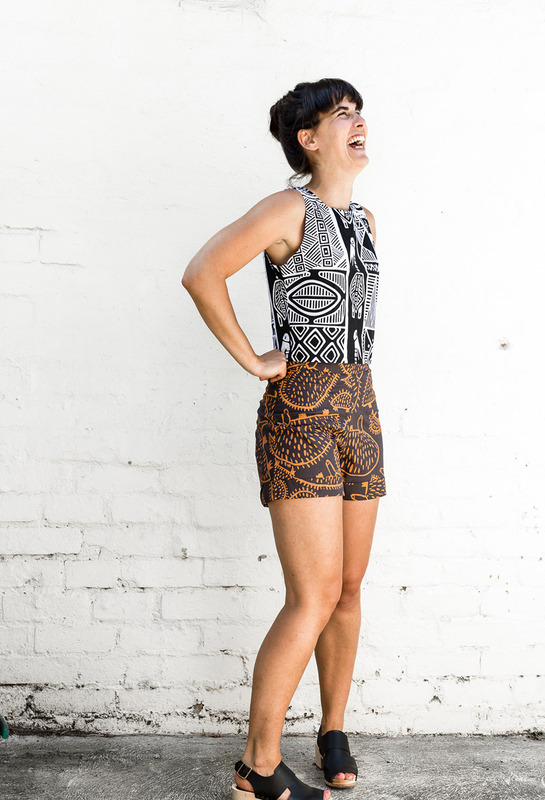 Robyn Barnard in Tiwi Designs Bede Tungatalum’s Tiwi Bird print top; and Palngun Wurnangat Aboriginal Corporation (Wadeye), Bridget Bunduck echidna print shorts – by Magpie Goose. Image Credit photo by Sarah Mackie. I am constantly inspired by the Aboriginal people that I work with; both from my three years working as a civil lawyer at NAAJA, and my work now with Magpie Goose. There are so many daily challenges and punitive government policies that people have to deal with – one of the most pervasive one we see in the NT now is the Community Development Program (CDP, or ‘work for the dole), a welfare system that requires people to do either belittling ‘activities’ (e.g. painting rocks, paper quilling), or unpaid manual labour (that should be a paid job- e.g. mowing lawns, fixing houses) for five hours every day, five days a week. Despite all this – people remain positive, continue to thrive on country, create beautiful art, and do their best to keep culture strong. 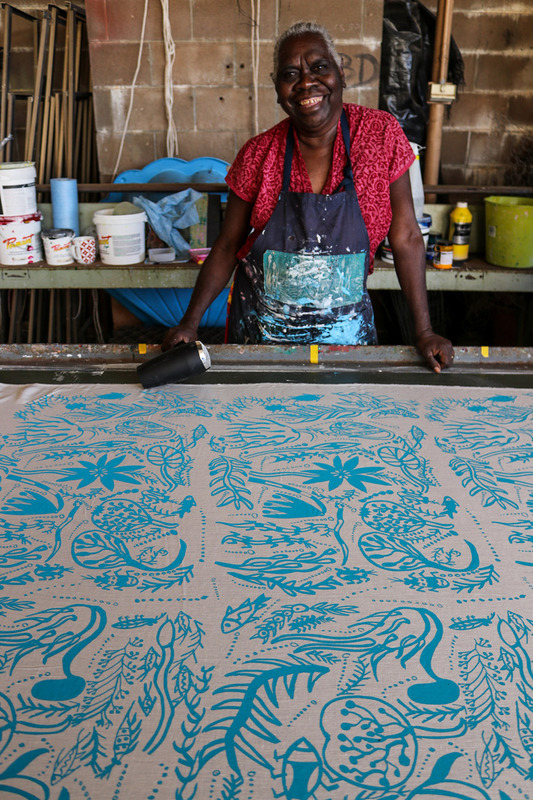 I’m inspired by all the incredible Aboriginal artists of the Top End – who have been finessing the art of textile design over many years (Tiwi Design on Bathurst Island and Babbarra Design in Maningrida have been printing since the 60s!). Their ability to distill complex songlines, dreaming stories, seasons, maps of country into beautiful pieces of work is so incredible. We created Magpie Goose to be a platform to showcase a wide selection of incredible artists and screen-printers from across the NT- our clothing designs are really just the blank canvas to showcase all these amazing designs! The artists that we work with are inspired by the whole sphere of life in the Top End. One print depicts a fresh water prawn (wakih) that is good food found in the billabongs on the artist’s (Reuben Manakgu) country in West Arnhem; another print by Elizabeth Kandabuma from Maningrida, depicts the special type of cloud that signal the wet season is coming to an end; another by Tiwi artist Bede Tungatalum details the pukumani pole, which is carved as part of the funeral ceremony to demonstrate the status of the deceased, and allow their spirit to pass into the next world. This is our first Finders Keepers market – we are really looking forward to checking out all the other stallholders! Phelecia Daylight in Palngun Wurnangat Aboriginal Corporation (Wadeye) ‘waves’ print by Leonie Melpi – By Magpie Goose. Image credit Photo by Rhett Hammerton. Our proudest moment to date – aside from being star-spotted in the line for pizza in Coober Pedy, and being a crossword clue for The Age – is being able to offer screenprinting training and employment to five Aboriginal jobseekers in Katherine. These guys – Aaron, Michael, Andra, Martha and Alison – have been participating in CDP/‘work for the dole’ activities for many years, with little chance of employment (the unemployment rate in Katherine is huge). They all have aspirations to get off Centrelink, and make a career as an artist / screenprinter. 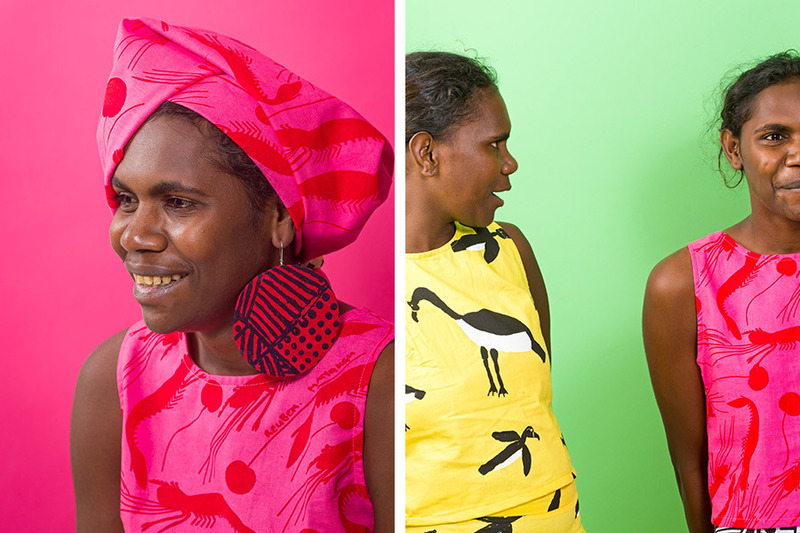 We created Magpie Goose with a mission to bring fabulous Aboriginal art to the world through fashion, while offering enterprise learning and employment opportunities to Aboriginal people in partner communities, and Katherine, as the business grows. It’s very exciting that we’re able to have our very own crew of screen-printers in Katherine, and demonstrate to government that there is a viable alternative to CDP – enterprise! We look forward to working with our screenprinting crew to get some of their own designs onto screens, fabric, and made into fabulous fashion! Marita Perdjert in Tiwi Design, Bede Tungatalum ‘pukumani pole’ print top; and Babbarra Designs Dora Diaguma’s Murnubbarr Karrolka (flying magpie geese) print shorts; and Patsy Tchinbruru in magpie geese top, and Tiwi Designs Jean Baptiste Apuatimi’s Jilamara design skirt – By Mapgie Goose Image credit Photo by Maggie McGowan. Luv your work – can I order on-line?